Renal vein thrombosis in a transplanted kidney is an uncommon but critical complication that can result in graft loss if management is delayed. A 31-year-old male with known atresia of the inferior vena cava who received a deceased donor renal transplant 7 years previously presented to hospital with severe graft site pain and a week of nausea, vomiting, and chills. 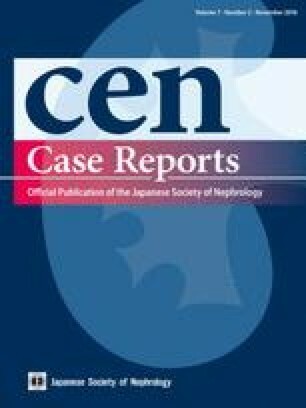 Serum creatinine was markedly elevated from baseline. Sonographic examination revealed external iliac vein thrombosis with extension of the thrombus into the transplant renal vein. Urgent angiographic administration of tissue plasminogen activator and suction thrombectomy was performed, then followed by heparin and clopidogrel post procedure. Within 24 h, his serum creatinine improved, and within 2 weeks returned to his baseline. He was started on lifelong warfarin anti-coagulation to reduce the risk of rethrombosis secondary to his uncorrectable aberrant venous anatomy. Due to the turbulent and sometimes reversed flow in the major veins, lifelong anticoagulation should be strongly considered for such transplant patients with recipient aberrancy of the large veins. Informed consent was obtained from the individual included in the study. All procedures performed were in accordance with the ethical standards of the institutional research committee of the University of Saskatchewan and the Saskatoon Health Region (Bio REB#12-44).